Chinese government scholarships (CGS) are awarded by Chinese Scholarship council (CSC) to international students in Chines universities affiliated with CSC. CSC online application system is started from Oct-November and remained open till May-June of next year. CSC affiliated universities/embassies announced their schedule for receiving application during this time period. Results are announced in May-July. Successful students join universities from I September. 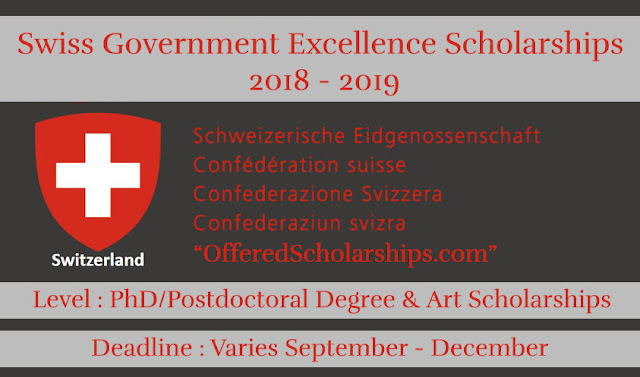 These scholarships are awarded to students through agencies i.e., (a) universities (b) Chinese embassies in other countries, which have diplomatic relations with China. Students can prepare their application material and submit to university directly. As for embassy application is concerned, embassies generally receive applications in other countries via some Higher Education Institute / Ministry of Education of that country. Scholarship via embassy is also called "Bilateral Program". CGS application procedure is very simple and students can prepare their application easily. Students don't need to consult and pay money to any agent/ consultant. CSC/Chinese universities don't have authorized agent/consultant anywhere. Here. If someone claims so, he is fake and is doing illegal activity. Before student start scholarship application procedure, he should select some good university offering CGS in his program and research field. University program details can be searched very well on CSC website. Here is the list of all the universities offering CGS Scholarship http://www.csc.edu.cn/studyinchina/universityen.aspx. For university selection, consider overall repute of university, research published by university/department/group in you research field, Instruction language, time period of the course etc., For that purpose you can go to this link and search for your program and it will list all the universities under CGS offering your program http://www.csc.edu.cn/studyinchina/programsearchen.aspx. A university has its own policy to give scholarship in specific programs and subjects. Once student selects a university he can explore the website of university to know the CGS schedule, department, and faculty details of that university. 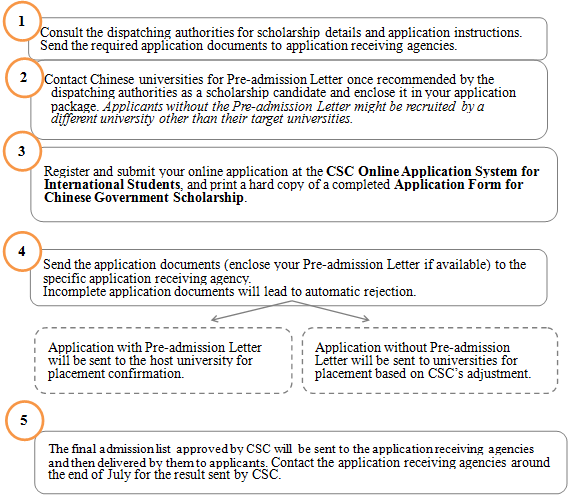 CSC developed an online application system for all students who want to apply for scholarship in Chinese universities. All students need to make an account for online application on this website (http://laihua.csc.edu.cn). From one account, students can apply in one university only. If somebody want to apply in more than one university then he need to make more accounts. To make a new account, students need email address. Many account can be made using single email address. In online application, first select category B and then students are required to enter "Agency number". Agency number is code given to each agency (universities and Chinese embassies). Agency number of universities are given in this site (https://www.china-admissions.com/study-in-china-guide/agency-numbers-chinese-scholarships/) or you can google for complete list. Some universities also need to apply on that university website, So, first read instruction of application from university website. Other notable things in online application are academic records, bio-data, details of program to be studied, university etc. while filling on line application please note followings. · When you enter agency number of a university, it will become your "First Preference University" automatically. · If you are applying in university directly, you don't need to write 2nd and 3rd university preference. · If you are applying via embassy then you will write agency number of embassy and also write three universities in preference options. · Study duration will be like this "From 1 September 2015 to 15 July 2018" for 3 years PhD program. Duration depends on your program. If it includes one year Chinese language then it will be written as "From 1 September 2015 to 15 July 2019". Check your university program details on university website before filling application. · Check your university website/international student office for language requirement details. If your university has English language programs then apply for it otherwise you have to apply for Chinese language program and you have to attend Chinese language classes for one year. · Once you complete your application for one university then don’t use this account for another university by changing agency number. By doing so, your first university online data will be erased from university and CSC database. After completing the on line application, submit this and take a print of application pdf file and also save this for your personal record. Print (hard copy) of application must have a "serial number" and page number at the bottom of each page which often missed due to wrong selection of page size during printer. Application materials include all documents required by university/CSC for application processing. These documents are of two type i.e. compulsory documents and optional documents. Details of these is given below. Students should photocopy two recently obtained degree/certificates (For PhD, these will be Master and Bachelor degrees) and transcript/ DMC of highest degree and attest them. According to CSC instructions, academic certificate should be notarized. Here I would like to clarify that china don't have "Gazetted Officer" system of attestation like Indian subcontinent. So they use term Notarization and Attestation in similar meanings. In my opinion, students can attest their documents from University (assistant/associate/full) professor. Students can also visit Notary Public but it will cost. Result awaiting student can also apply if their results will come before May-June. They can attach Hope/Provisional certificate for final semester/year. At the time of application, student don't need to attest from foreign office, or some higher education institute. Blank Foreigner physical examination form can be downloaded from (http://en.csc.edu.cn/uploads/foreinphy.pdf). CSC/universities don't instruct students to visit some special hospital in their countries. Simple way to get this Examination Form is to visit some Government Hospital. They will do required tests and then make Examination Form for you. Students are suggested to not spend too much money at this stage by visiting some expensive private hospital. Later, if they succeed to get scholarship then they can do it again. Doctor should stamp and sign both sides of Foreigner Physical examination Form especially front side picture must be stamped. Student will attach photocopy of this form with application. Photocopy don't need attestation like academic documents. Students required to submit two Recommendation Letters. These letters should be issued by two different teacher from student previous (preferably recently attended) university. Letters should be issued by Associate/Full professor according to CSC/universities instructions. Sometime they accept Assistant Professor issued letter as well but this is favor and depends upon the International Student Office (ISO) people. Student need to attach "Original" letter with application not photocopy/color copy/attested photocopy. Sometime ISO people can favor and accept photocopy but this favor is occasionally. A simple pattern of Recommendation Letter is given below. It is my pleasure to write this letter of recommendation on behalf of Mr. ____ for Chinese Government Scholarship 2017-18 program. I have known ___ for __ years, since he was a student in my ____. I believe to be an exemplary student-scholar as well as a person of tremendous character with significant leadership skills. He is a truly outstanding student who has accumulated a long list of both academic honors/achievements and extra-curricular activities. He has demonstrated his versatility by participating in sports, as fund-raiser, and organizer in number of student's events. I can attest to ___’s maturity and his commitment to studies. He does his work conscientiously, he always seeks out course work that challenges him. He has an amazing capacity for fulfilling his responsibilities in a great variety of activities. He is organized in his goal-setting. Intellectually, he is one of the best students I have ever taught/ supervised. He has the ability to carry out research independently, he is extremely disciplined in his work, his analytical skills are highly developed and he is always thorough in what he does. I highly recommend ____ for this Scholarship opportunity in your esteemed institution. I believe his proposed course of study/research field is suitable .His spirit and disciplined approach to learning make him particularly well suited to take advantage of this opportunity. Recommendation letters should be made either on university/ department letter head with teacher signature or on sample page with teacher signature and stamp. According CSC/University instructions, student should submit a Research plan/ proposal (for PHD/MS) /Study Plan (MS/BS) not less than 800 words. An average Research / Study Plan of 1000-1200 words is ok. While preparing it, use simple and understandable language, avoid unnecessary formatting like too many headings, colored stuff, etc. and excessive details. Research plan/proposal explains student research background (if have), future research plan (introduction and background), research methodology (methods and requirement), expected results, applications, and references. While study plan (sometimes called Statement of Purpose) is more general as compared to Research plan. It includes the student's introduction, educational background motives/aims for further higher education, and brief future research intentions. Optional documents are not necessary to submit along with application and sometime their presence can be very useful. Acceptance letter is most important optional document which is sometime declared compulsory by some universities. Acceptance letter can be obtained by contacting some Chinese teacher who will agree to accept you in his research group. Student can find some good teacher by finding email address from university website. Students can also search teacher from research papers published by teachers. For this, you can search in "Google Scholar" like "Topic + university name". After you find some good research papers matching your research field, you can obtain email of corresponding author and contact him. You can send email to him in which you will briefly explain your research interest, urge to study in that university under CGS and want to do research in his group. If he agrees to accept you in his group then he will write an invitation letter / Acceptance Letter for you. Student will attach this letter with CGS application. Mostly Chinese teachers ask for some template of Invitation / Acceptance Letter and later they made letter for you based on that template. Acceptance Letter/Invitation Letter should be made either on university/ department letter head with teacher signature or on simple page with teacher signature and stamp. Passport is important document because you have to write passport number in online application website of CGS for completing your online application procedure. If a student get scholarship then university mention passport number on visa documents which is good. University issue visa documents to successful candidate. Sometime Chinese universities asks for ILETS/TOFEL when students apply for English language programs. If you have ILETS/TOFEL, you can send them otherwise you can made an English Proficiency Certificate from your university/department of previous university in which they will certify that you completed your MS/BS degree using English language as language of instructions. And you your English language skills are good enough to study PhD/MS in English language. Other optional documents include research papers, awards (academic, extracurricular activities) certificates, and research work experience certificate etc. While attaching these documents, only attach internationally and well recognized documents. Above mentioned on line application process and preparation of application material is standard CSC requirement and process. All CSC affiliated universities have to follow this standard procedure. Beside this standard procedure, some university have additional requirements like Processing Fee, online registration on university website etc. After completing CSC standard process, students must check that university website to know university requirements. Standard CSC application process is free but some universities also demand for processing fee which can range from 400 RMB to 600RMB vary from university to university. All details of fee, university bank account and depositing methods are given on university website. Most convenient way to ask some friend in china to deposit fee on your behalf and he should mention your name while depositing fee. Students can also pay via VISA credit cards as well. Western union cost too much when money is deposited to a bank account in other country. Some universities also ask students to fill a registration form on university website also other than CSC online application website. Students have to fill both application forms to fulfill the requirement of university and CSC. Final step is to dispatch the scholarship application, to dispatching authorities or agencies. Dispatching authorities or agencies are universities or Chinese embassies where you want to apply. Students applying directly to university will dispatch scholarship application to university while students under bilateral program will send their application to Chinese embassy in their country or some higher education institute in their country. Take the print of the on line CSC application, paste photos and sign it with date. Attach above mentioned required documents. Make one complete set of all application material. Similarly make another set. According to standard CSC procedure, student is required to send two set of application material to university/ embassy. However, some universities may ask for more. You can consult ISO of universities to know exact requirement. In first set, you can attach original Recommendation Letters while in others set photocopies are also ok. Proper university address is very important in application dispatching. It is better to call/email international student office to know address in following format otherwise, courier service people face problem in delivering the post. If your university address has above mentioned address details on website then send to university. Courier service selection is very important factor. A number of courier services / postal services are available internationally for china. Government postal services are often cheap but don't have online tracking system. Other courier services are expensive but have tracking systems. These courier service offer special university/students offers which are cheap. Their normal package is generally expensive. This was the complete application procedure guideline, before asking a question please once go through it, after that if you need any help please feel free to comment below we will guide you properly, Thanks.